Posted on 5, April 2016 by EuropaWire PR Editors | This entry was posted in Awards, Insurance, Italy and tagged best export credit agency in Europe, CDP group, SACE, Trade Finance Magazine. Bookmark the permalink. 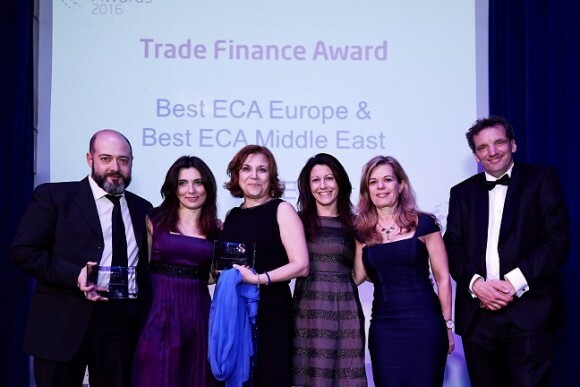 ROME, 05-Apr-2016 — /EuropaWire/ — SACE, the insurance-financial company of the CDP group, has been honored as the best export credit agency in Europe and the Middle East as part of the Awards for Excellence promoted by Trade Finance Magazine. Based on submissions, editorial judgement and an external judging panel appointed by Trade Finance, the award is important recognition of SACE’s activity in trade finance and project finance, in support of large corporations and SMEs, with particular reference to the two geographical macro-areas that account for € 17.5 billion and € 4.7 billion, respectively, in the portfolio of exports insured and investments guaranteed by SACE. This recognition is also confirmed by SACE’s performance in 2015, where the € 9.7 billion in new guarantees granted concerned primarily the European Union (33%) and the Middle East and North Africa (27.7%). This latter region remains one of the areas of greatest future potential for Italian exporters and SACE. Despite its characteristic instability and the problems posed by declining commodity prices, the area continues to be a significant pool for exports and investments in various industrial sectors and Italian consumer products. SACE has opened a new office in Dubai, a point of reference for all companies interested in operating in the region, with particular focus on Iran, where changes in the international sanctions situation are permitting a gradual return to trade and a greater capacity to attract foreign investment. SACE, a CDP Group company, offers services of export credit, credit insurance, foreign investment protection, financial guarantees, surety and factoring. With € 81 billion in transactions insured in over 198 countries, the SACE group supports the competitiveness of companies in Italy and abroad, ensuring more stable cash flows and transforming the default risks of companies into development opportunities.